Cape Fear Museum at 814 Market Street, Wilmington, NC. "The Oldest History Museum in North Carolina"
Cape Fear Museum collects, preserves and interprets objects relating to the history, science and cultures of the Lower Cape Fear, and makes those objects and their interpretation available to the public through educational exhibitions and programs. 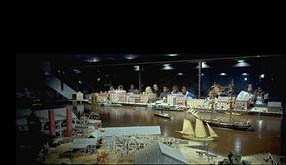 Model of Wilmington's waterfront, 1863. Founded in 1898 by the United Daughters of the Confederacy, Cape Fear Museum is the oldest history museum in North Carolina. For an overview of the cultural and natural histories of the Cape Fear region from prehistory to the present, the Cape Fear Museum stands unsurpassed. 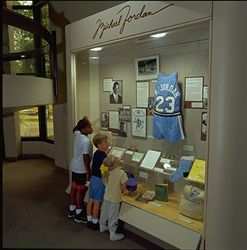 Long-Term Exhibit: Michael Jordan Discovery Gallery. Discover the natural history of southeastern North Carolina. Designed for children and families, the exhibit examines the varied environments comprising the ecology of southeastern North Carolina: the Upland Forest, the Bottomlands, and the Maritime Forest. The exhibit features a Human Impact section which - focuses on how humans affect the environment. Children may enjoy the hands-on activities in the gallery, including a life-sized beaver lodge to play inside. The exhibit includes a showcase filled with artifacts from Michael Jordan's youth, including his basketball uniform from UNC-Chapel Hill and his first paycheck stub from an after-school job at Whitey's El-Berta Restaurant in Wilmington. Artifacts from Michael Jordan's youth. Long-Term Exhibit: Waves and Current: The Lower Cape Fear Story. The exhibit tells a chronological story from prehistory to the present day, and includes thousands of artifacts and photographs. Visitors learn about the settlement of the region, the American Revolution, the antebellum period, the Civil War, Reconstruction and the twentieth century through life-sized settings, videos and hands-on children's activities. The exhibit includes a 16- by 21-foot model of the downtown Wilmington waterfront as it looked in 1863, and a 200+ square-foot diorama with a narrative summary of the Battle of Fort Fisher. In the 20th-century Gallery--Transportation in the 20th Century explores land, air and water travel and includes the popular "Trolley Ride to Wrightsville Beach" audiovisual program. Long-term exhibit: Haines Bride Figures. Twenty-nine handcrafted bride figures characterize historic women, including Pocahontas of Jamestown, Virginia; Elizabeth Maxwell Steele of North Carolina, and Queen Nefertiti of Egypt. Frank Haines carved each unique figure from wood in 1/3 scale; Elizabeth H Haines researched and stitched each costume in detail. The exhibit features selections from the more than 100 flags in our collections, representing patriotism, communication, organizations and events in the region's history, including several flags from the Civil and Spanish-American wars. This exciting exhibit will focus on flag preservation and conservation with elements that explain the scientific processes conservators use to preserve historic flags. Experience a taste of Cape Fear's past. Explore the impact of agriculture and transportation on the port city's marketplace and discover the diversity of foods prepared and served in 19th century Wilmington. 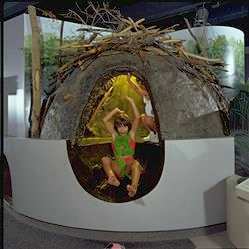 Cape Fear Museum is open 9 AM-5 PM Tuesday through Saturday and 1-5 PM on Sundays. Open seven days a week from Memorial Day through Labor Day. $5 for adults; $4 for students with valid I.D. and senior citizens; $1 for children 3-17; and free for children under 3 and members of Cape Fear Museum Associates. 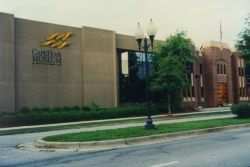 The museum is located at 814 Market Street in historic downtown Wilmington, NC. 910-341-4350.